After a few days break, I’m back on track. I don’t even know how I’d classify what I’ve been doing. Miscellaneous, I guess. I’ve fixed a few things that were bugging me. Not big things, things probably most people wouldn’t even notice/mind. I’m not usually a perfectionist, just when it comes to thing I am passionate about. One of the awesome little things that I’ve done is fix the god awful nvl screen. 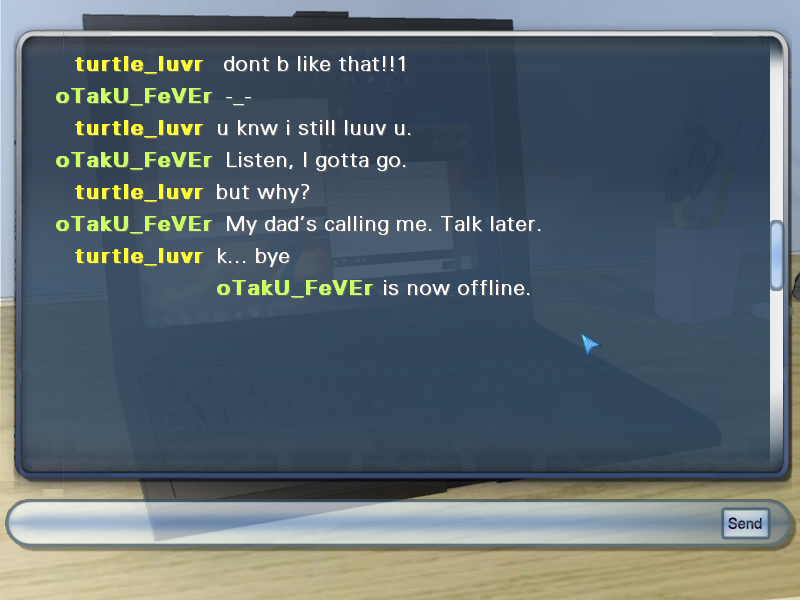 I used nvl when showing online chat. But it had the default look, plus the game menu buttons would continue to show even when in nvl, when the rest of the textbox was gone. That drove me crazy. The solution was quite simple, but it took months for me to care enough to look for it. Until recently I always thought there were better things to do, but now that the project is approaching completion (omg! can’t believe I said that! ), it’s time to do all the little things I always put off. So, to show you a little piece of what I did today, here’s the new “chat window”. It’s actually just a plain old png. The button and scroll don’t do anything, I hope people won’t click them and be all confused. It would be possible to actually make a functional messenger, of course, but I have to draw the line somewhere if I want this finished any time soon. "Yes, I know my ID is stupid, I was 11 when I made it, ok?" I did some other stuff, too. Fixed some annoying stuff in the game, thanks to the wonderful people on http://lemmasoft.renai.us/forums/ I would have been lost without them. Finally I can start implementing my idea, which is that whenever you find a character’s special ending it will color his picture in the main menu. I forgot to mention the endings – all written! 3 for Devli-pooh (hehe), 3 for Alden and 4 for Seth cause he’s awesome like that. LOL. One of Dev’s ending could be considered the alone ending though, because you don’t actually get to have a “confrontation”. This only happens if you pursue Devlin, but don’t get a special event. I’ve decided on naming the endings rather than numbering them. I will probably write “special ending” on the special ones, but so far I have: 3 special endings (you need a lot of points for these, probably a walk-through or something), 4 good/normal endings (some are happier than others), and 3 bad endings (not necessarily bad, I try to not let it be too depressing).